Nelly Mandengue (fully funded by France) serves as a UN Volunteer with UNDP in the Central African Republic. Jean-Pierre Kisamare (Burundi) is a UN Volunteer Digital Communications Officer with the United Nations Development Programme (UNDP) in Libya. Serving in different parts of the continent, Nelly and Jean-Pierre share how they advocate for the legal mechanism addressing violations of human rights and promote awareness of sustainable development through their assignments in communications. UN Volunteer Digital Communications Officer Jean-Pierre Kisamare (Burundi) serves with UNDP in Libya. As a dynamic communicator and experienced sensitizer, I became an international UN Volunteer in Central African Republic in October 2017. As a specialist in Communication and Awareness, I joined the UNDP joint project support team for of the Central African Special Criminal Court (SCC). The Special Criminal Court (SCC) is a special jurisdiction within the Central African justice system created in 2015 to investigate and bring to court serious human rights violations and violations of International Humanitarian Law committed since 1 January 2003, as defined by the Central African Penal Code and by International Law. The purpose of the UNDP project is to contribute to the fight against impunity, restoration of the rule of law and support the process of national reconciliation to build sustainable peace. My assignment responsibilities include developing and implementing a communication strategy for the SCC, awareness raising and social mobilization. I also support the Special Prosecutor and all judges in their tasks. Considering my responsibilities, building awareness on SCC in the country is the most rewarding mission that I experienced. I had the opportunity to be in regular contact with the populations in Bangui and in other regions to explain them the importance and mandate of the Court, and identified their expectations for the justice. I also provided capacity building sessions for journalists for better understanding and treatment of justice processes. The work is not easy every day, because the mission of the SCC will be to judge the most serious crimes committed in the Central African Republic, including crimes of genocide, war crimes and crimes against humanity and human rights violations. There are poignant testimonies of people who have suffered human rights violations and abuses. However, these experiences are additional motivation for me to do my best to meet the aspiration of the people. Working as international volunteer, I have grown so much as a professional and individual. One of the essential elements of volunteerism that I learned is 'adaptability'. There are always unexpected situations that you have to respond to with an open and positive spirit, hence adaptability and patience are key qualities for daily work. I am convinced that embarking on this UN Volunteer assignment is one of the best decisions I have made. I have a permanent desire to learn, to improve and to put my skills at the service of development. In this context, volunteering clearly appears to be instructive and enriching at all levels. It is an opportunity which every one of us should have at least once in our life; I can only encourage those who still hesitate: Go for it! UNDP has been working in Libya since 1976. Over the years, it has re-aligned its support to meet emerging priorities in the country. Since the outbreak of conflict in 2014 and the deteriorating humanitarian situation, UNDP continues to support Libya's transition to an inclusive political agreement, accountable governance, stabilization, economic recovery and resilience.UNDP is currently implementing a number of projects in Libya that are helping to advance progress towards the Sustainable Development Goals, particularly those on good health and well-being, quality education and gender equality, as well as peace, justice and strong institutions. Sustainable development and democratic governance and peacebuilding are the two pillars of the UNDP focus in Libya. As a UN Volunteer Digital Communications Officer managing the UNDP Facebook, Twitter and YouTube accounts, among other things, I am helping to show who we are, what we do and how we make an impact. This is also an opportunity to inform and educate the general public on the Sustainable Development Goals, and particularly those we are focused on. Joining UNDP Libya as an international UNV is providing a new experience in my life. It is the first time that I work for a UN organization, and I am learning a lot about UNDP and particularly communicating the SDGs. 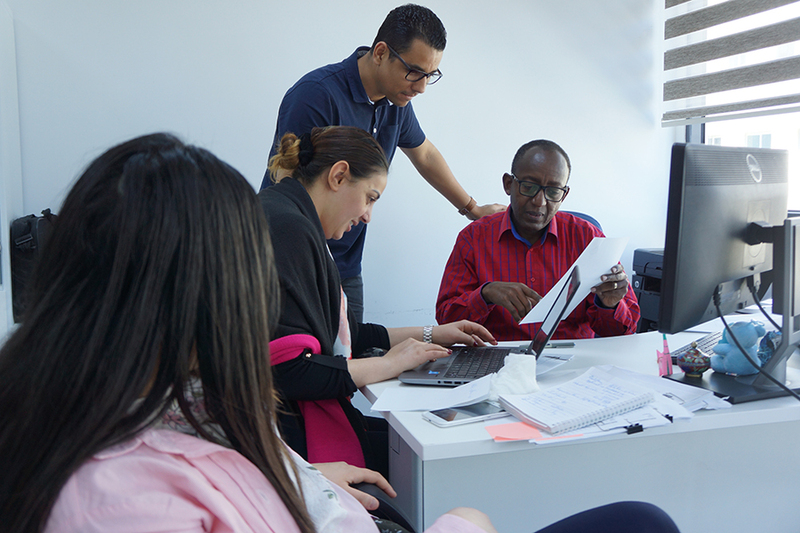 The Libyan context is still difficult and some of the staff (including myself) are still working in the back office in Tunis. We are operating with the support of field reporters in Libya to collect information on the ground. I am currently finalizing a digital communications strategy. The tool is going to help to engage with the audience (mainly the general public) in an effective manner. Prior to joining UNDP in Libya in mid-March 2018, I worked for the International Fertilizer Development Centre (IFDC) in Burundi for eight years as a communication officer. IFDC is a public international organization that is involved in the development of agri-inputs markets on one hand, and in the improvement of agricultural value chains on the other. This position enabled me to interact with beneficiaries (mainly smallholder farmers) through various communication tools (radio programmes, flyers, educative videos), talking about innovative methods to improve agricultural productivity. Before that, I worked for the Burundi Human Rights Association "Ligue ITEKA" as an Information Officer for five years, where I had the opportunity to engage with people while we were training them on the promotion and respect of human rights. This experience of more than 10 years working with people on the ground motivated me to join UN Volunteers and continue to be useful for people, particularly those who are vulnerable.